There are advantages to taking a color tour by car. You can cover a lot of ground -- and you don’t have to worry that windy, cold or rainy weather will ruin your experience. (Although sometimes I think a little rain can actually make the colors look brighter.) But the best way to experience the full sensory overload of autumn -- the sound and smell of those new-fallen leaves, the feel of the breeze -- is to get out and spend some time hiking or cycling one of our many trails. Of course, you have to pick the right kind of trail! Some provide cozy tunnels through deep woods, where the colors surround you on every side and there’s plenty of protection from autumn winds. Others are high on open hillsides, where you can get sweeping views of sky, water and autumn foliage and that dramatic interplay of sunlight and shadow. 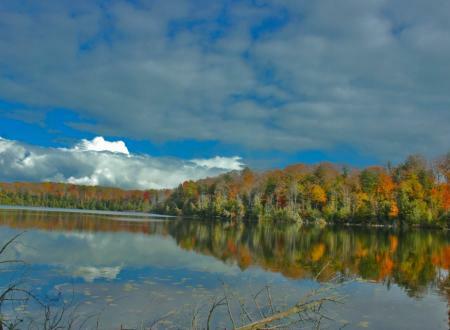 The Timbers Recreation Area on North Long Lake Road, just 10 minutes west of town is a 250 acre preserve, complete with trails, historic buildings and 9,000 feet of waterfront on three lakes, and it’s open to the public. 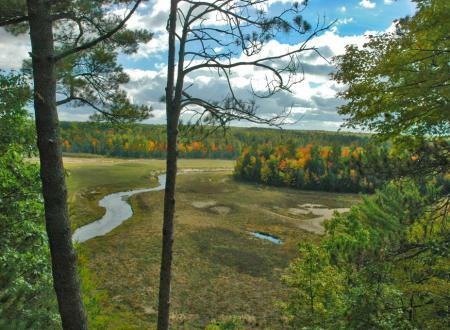 Once the backwoods retreat of meat magnate J. Ogden Armour and his family, then a Girl Scout camp, it’s now being administered by the Grand Traverse Regional Land Conservancy. The really impressive thing about The Timbers is how much land is just there. Almost 2,000 feet of frontage on Long Lake, an entire 20-acre lake (Fern Lake) inside its boundaries with 4,500 feet of shoreline, and 2,400 feet of shore on yet another, Page Lake. There are two-tracks and trails winding their way through woods, meadows and fields. Most people know Old Mission Lighthouse Park, near the tip of the Old Mission Peninsula, for its handsome little 1870 lighthouse, but it’s also home to more than 500 acres of trails that wander through a fascinating variety of terrain. 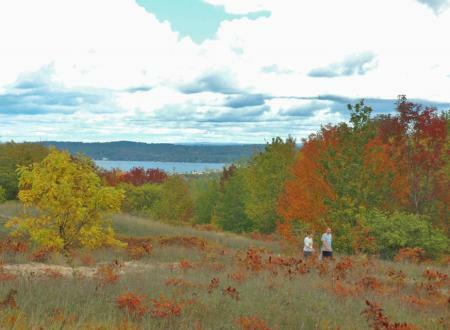 There are shady coastal forests of hemlocks, steep bluffs covered with ferns, bright upland woods of beech and maple, broad meadows where old cherry orchards are being reclaimed by aspen, elm and chokeberry, and high ridges where you can glimpse the dark blue of Grand Traverse Bay, and the smoky purple hills of the Leelanau Peninsula. The high country here is rich in wildlife: deer, coyote, fox and rabbits, and birds too numerous to mention. Want to stay close to town? 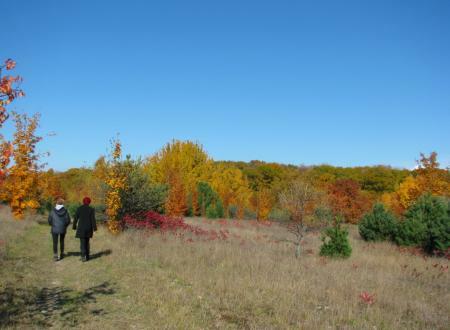 No problem -- some of the loveliest fall trails in the area are on the grounds of the Grand Traverse Commons. 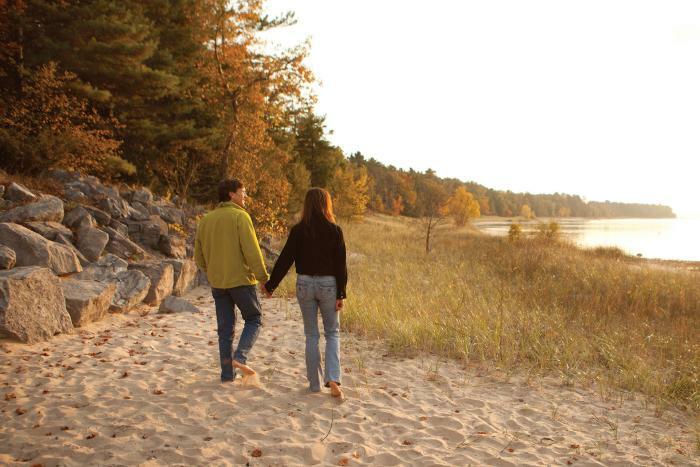 Surrounding the beautiful old buildings of Traverse City’s former mental asylum is an extensive network of hiking trails that weave through the surrounding forests, fields and hills. With hundreds of acres of forested hills, spring-fed streams, flowery meadows and winding trails -- not to mention the imposing, if slightly spooky walls and towers of the old asylum itself -- the Commons has long been a favorite with hikers, joggers, cyclists and birdwatchers. The best fall color is west of the buildings, in the Grand Traverse Commons Natural Area, where you can choose from an impressive variety of landscapes -- from the fragrant shadows of the Cedar Cathedral Trail and the storybook beauty of the Streamside Loop to the steep climbs and panoramic views of the Old Orchard Trail, where you can look down over most of Traverse City, and the Copper Ridge Trail, which runs just behind it. There are secret springs bubbling out of the hillsides, deer and fox peering out from the trees, and a multitude of birds -- and the best time to be here is definitely autumn, when the meadows are full of asters and goldenrod, the old orchards still smell of windfall apples, and the leaves rain down on you like a technicolor shower every time the wind runs through the treetops. But sometimes you need to get away from it all. And that’s when you should check out the 1,320-acre Brown Bridge Quiet Area. Located on the Boardman River, it’s actually owned by the City of Traverse City even though it’s about 11 miles upstream from the city limits. Until a few years ago, this was the site of a beautiful forest lake, Brown Bridge Pond, created by a hydroelectric dam that has since been removed. Now the river runs through a narrow valley when tall 300-foot bluffs on the north side where you can stop at scattered viewing platforms to enjoy the fall scenery. A former newspaper writer, Mike Norton was the media relations manager at Traverse City Tourism. He loves to walk, bicycle and kayak in the three seasons when our water is usually in liquid form. For the rest of the year he prefers snowshoeing and skinny-skiing.